Flip Wilson, groundbreaking comedian of the 1960s and ‘70s, elevated two comic catchphrases to status in the American vernacular. His stage character, Geraldine, played in drag, often ended skits with the expository screech, “The Devil made me do it!” It never failed to bring raucous laughter. Invoking innocence based on the influence of an outside force is commonplace in human behavior. And maybe it’s not so far removed from truth. Free at Last? Not so Fast. Whether a human being suffers pre-destination or operates under a free will was a debate labored over long and hard in my college days, usually at the Blackstone Hotel’s Golden Spur with late night Camels and coffee. Ever the humanist, I would usually take the “free will” side of the argument back then. Things have changed. There is increasing evidence and a growing school of thought that human behavior is indeed dictated, not by some divine intervention or even an ambiguous metaphysical notion called fate, but by the lively forces that surround us in a holistic universe. It appears that we are indeed “all one” and that we are just a part of the overall, operating under the influence of forces far less understood that we thought. Medical research and bio-physiologists are increasingly considering the influence on human activity and health that is imposed by the trillions of living organisms that have set up camp in our body, mostly in the intestinal tract. This population of non-human cells is collectively known as the microbiome. I intuited their impact decades ago. My mom liked jellybeans. She always had a bowl of them on the coffee table. One day in the early ‘90s I sat in the living room of my parents’ house watching TV. I didn’t know an exact trigger, but I thought of getting up and grabbing a couple jelly beans. I popped them in my mouth and within seconds was back for a larger handful. After a couple trips to the candy dish, I noticed that I didn’t really want any more. In fact, my stomach was starting to rebel at the glut of sugar. But still, I couldn’t stop grabbing the gummies. I felt like an automaton, driven by some unknown force to get up, grab more, sit down, grab yet more — until I had to force myself to stop. That feeling of submission impressed me. I thought of things I’d read about overabundance of yeast in the human body, and I drew a connection. Yeast thrives on sugar. What if a community of yeast cells were somehow clamoring for sustenance and compelling my urges? I found it reasonable, if a little Larry Niven-ish, a little spooky. Fast forward a couple, three, decades. What we now know is that the human biome absolutely is linked to our behavior and activity, as well as our appetites and health. Approximately 100 trillion bacteria, fungi, animals and bugs live in the human body. The balance of the population makeup is linked to any number of diseases, immune system performance, chronic ailments and behavior. How we feel, what we do, our moods, how we live can be dictated by the needs and cravings of the living organisms inside our host body. And they have the ability to direct us in ways not entirely understood. I was right. Those jellybeans may not have been for me. Maybe they were intended to feed the immediate appetite of the sub-community in my body. The condition and makeup of our intestinal biome is linked to diabetes, immune system, allergies including asthma, cancers. 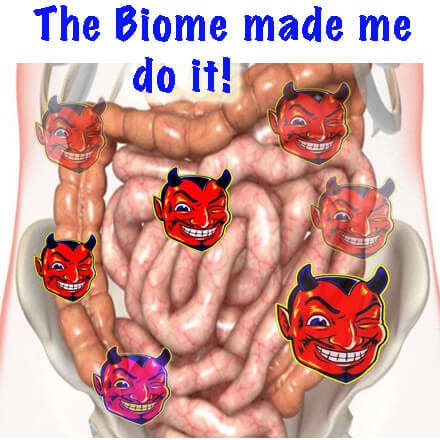 Obesity and insulin suppression, hormonal imbalances, depression and suicidal tendencies are all linked to what is going on with our intestinal biome. How it operates is unclear but the influence is not. Too much epidemiological evidence exists to argue with it. It is likely that nearly every part of human life is impacted by our microbiome if we let it exert influence. One researcher likened taking antibiotics to using a sledgehammer on the gut bacteria. And when you kill off a large part of the population with drugs, there goes the neighborhood. Riffraff and opportunistic pathogens move in and you’re apt to get sick. So, if you want to stay healthy, you’ll want to be a positive influence on the healthy balance of your cohabitants. Start researching that because there’s nowhere near enough room here to fill you in. Some basics include fastidiously avoiding antibiotics and all prescription drugs, processed foods, sugars and GMOs while keeping your stress levels down and activity levels up. With children, avoid a C-section at birth. Breastfeeding is a must. So is exposure to nature in childhood. Stay away from antibiotics. As mentioned, there are many important ways to keep the zoo healthy. Michael Pollan wrote an interesting book in 2001, Botany of Desire. It notes that humans influence the evolution and development of plant life. But beyond that, it demonstrates that plants influence human behavior and activity as well. It shows that we humans don’t stand outside the web of nature; we are very much a part of it. In not-so-subtle ways then, the secret life of plants is influencing our behaviors. Before that, René Dubos wrote the Pulitzer Prize-winning So Human an Animal in 1969, about the time I was debating over coffee at the Golden Spur. Dubos also noted how the world around us, the universe in fact, especially our own world of technology, is of primary influence on our actions and development. We do not appear to be simple masters of our own fate. We can achieve that only if we realize it. When it comes to our microbiome, that community of trillions has more votes than we do, and we don’t even have super delegates to overrule them. Sadly, Flip Wilson died in 1998, but not before his other key delivery line was firmly established as a computing catchphrase. Geraldine often crowed, “What you see is what you get.” The acronym, WYSIWYG or “wiz-ee-wig”, is permanently entrenched as part of the software developer’s lexicon.